I’m all about learning new things (one of these days I may even learn to crochet) so when the opportunity arose to learn tatting I was there faster than if they were giving away free yarn. Well, maybe not that fast, but fast enough. 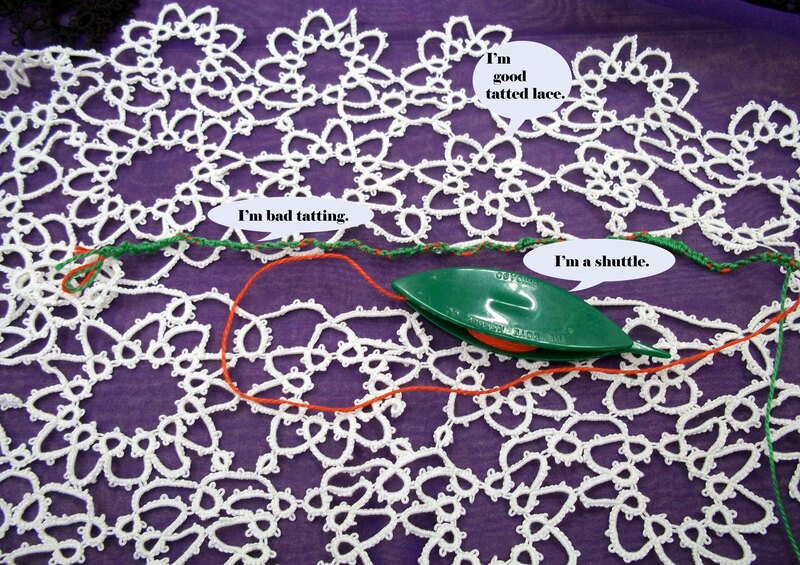 Tatting is a form of lace making that involves making a series of knots and loops. According to our instructor, Debra, is was originally done by fishermen to keep their hands supple in the winter, until some clever wife looked over one night and said, and I’m paraphrasing, “That’s pretty nice. I bet I could make a comely doily doing that. I’m going to head to the Hobby Lobby and get some thread.” Or something like that. There is shuttle tatting, which is the oldest style and what we learned, as well as, needle tatting and crochet tatting. Under Debra’s tutelage I made the red and green atrocity you see in the picture below. That ugly length is supposed to be the ‘double-stitch’ strand that forms the structure of tatting and would eventually be pretty loops, once one knows how to join them together. Basically, you make two half-hitch knots by wrapping one strand of thread around the ‘guide’ thread with a series of finger acrobatics and wrist swirls. I would describe it better, but it wouldn’t make any sense. Normally, you use two strands of the same color, but as a learner it’s easier to see the error of our ways with two different colors. Once you get the hang of it, it’s kind of like knitting in as much as there are two knots (kind of like knit and purl) that form the basis for what you’re creating and you kind of relax into the rhythm of it. Also like knitting, it’s really easy to do it too tight as a learner and what you make is ugly and riddled with errors. The idea is that the knots will be lose enough that you can slide them along the guide strand. Plus, looser knots make prettier tatting. I don't think I'll ever be making the good lace. Next lesson will encompass more than the knit and purl of tatting, so we’ll advance to the cable-cross and yarn-over equivalent tatting, but for now I just need to work on my half-hitches. Tatting is kind of a dying art that hasn’t experienced the resurgence of interest other fiber arts have enjoyed as we women take back our crafting heritage. So, you won’t find many tatting blogs, youtube videos teaching you to tatt, or cool new tatting books with reinvented projects with a modern twist. I did a google search for ‘learn to tatt video’ and almost all the results were for tattooing. However, if you live in the Salt Lake City/Ogden area of Utah you can learn to tatt at the Joann Fabric in Riverdale, where Debra will patiently guide you through the steps until you have your own ugly strand to show off. If you don’t live in this area, check out your local craft shops and maybe you can find an instructor in your area.